Bohemian-chic is in: that is a fact. But at times, the look can come off as a bit sloppy. The secret to pulling off clothes that send a shout-out to the 1970s? Pair them with tailored, well-constructed options to break up the look. It’s easiest to do this with tops, as you can pair them with almost anything and can always throw a jacket on top. I’ve separated 1970s tops into three categories: fringed vests, tunics, and plaid. I’ll also show you how to wear each top with some sample outfits below. Product Information: Suede Fringe Gilet – Topshop, Grey Fringe Waistcoat – Dorothy Perkins, Fringed Leather Vest – My Theresa. Fringed vests are everywhere right now, so you can find a lot of them in department stores.For a more authentic look, you can also find great vests at thrift and vintage stores (if you are willing to hunt for them!) These vests look great with jeans or a denim skirt, for class or going to the movies on a date. For the most flattering look for your body, make sure the bottom of the vest hits you at a spot that is proportional to your height so it doesn’t shorten your torso or leg-line. Product Information: Skinny Jeans – Debenhams. Studded Flats – Oli. Studded bag – Newlook. Rosa Pleated Top – Delias. Earrings – A’GACI. To pull off a vest with this much personality, I would keep the color palette simple: just gray, black, and two splashes of teal (or your favorite bright color). The white top I chose has a mock neck detailing, which is very 1970’s, but it’s tailored enough to work under the vest. (You could also throw on a white tee shirt and look just as chic!) A few stud details keep the look modern. 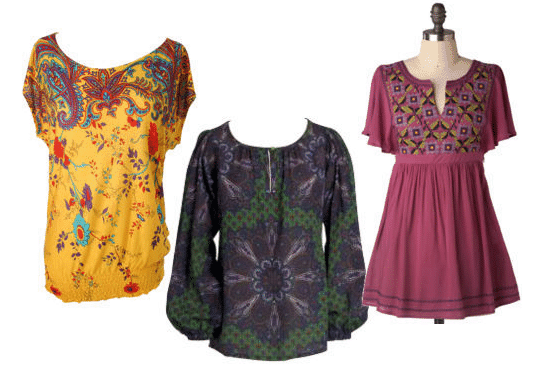 Product Information: Bohemian Paisley Blouse – Styles for Less. Marc by Marc Jacobs Peacock Paisley Top – Piperlime. Fruit Stand Tunic – ModCloth. I love the femininity of these tops: the details are delicate and the fabrics are flowy. The colors and patterns are daring, yet muted, and would work well with jeans for class or even trousers for work. To find tops like these in vintage of thrift stores, don’t be afraid to sift through and try on lots of options. Look for high quality fabrics and a fit that looks flowy, but not sloppy, on your body type. Pay attention to the label (if there is one) and any washing instructions; if you find tops like these in vintage shops, I would be particularly careful when washing them because the fabrics can be delicate. Don’t be afraid to go for a bold pattern or any bright details and have fun with it. Product Information: Restricted Audry T-Strap Pumps – Lulu’s. Trixxi Pencil Skirt – Kohl’s. Slanted Metal Accent Tote – Forever 21. Marc by Marc Jacobs Resin Logo Cuff – ShopBop. This outfit combines the flowy femininity of the ModCloth tunic with sleek professional pieces for a great outfit to wear to work or your internship. If it’s cold, you can throw a plain black cardigan on top and it will still look great and put together. Product Information: Tilt Plaid Cuff Top – Tilly’s. Line Dance Top – ModCloth. Generra Tunic – Bluefly. Plaid tops are another trend that has been popping up everywhere. While they’re normally associated with “grunge”, plaid tops were actually a staple long before the 1990’s! These plaid tops would make a great addition to any chic college girl’s wardrobe, because they are incredibly versatile – wear them to class, on dates, to the movies, to dinner… anywhere! It’s so easy to find great plaid tops in vintage stores and especially thrift stores, meaning you can find them for super cheap! Just make sure to get a top in the correct size – you’ll find plenty of extra-large button up plaid shirts, which can be fun, but for a timeless appeal, aim for more tailored silhouettes. To achieve this, make sure the fit and length are good for your body type and pay attention to any detailing. Keep your eyes peeled for mock neck tops or anything with a defined waist. And again, be careful with washing the garment. Product Information: Hawthorne Pumps – Heels.com. Lacey Cable Tweed Cardigan – Delias. Morgan Low-rise Skinny Jeans in Turkish Coffee – Delias. 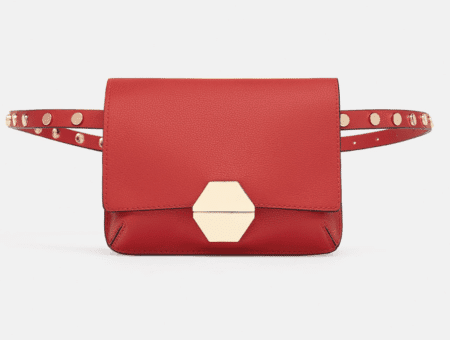 Patent Shoulder Bag – YesStyle.com. Vintage Fuchsia Button Earrings – 1928.com. My favorite thing about this Generra top was the color scheme: it would work well with browns and burnt oranges, deep reds, or even a few emerald green accent pieces – so versatile! I chose a dark red and brown color scheme, because these are my favorite colors for fall. What do you think of these 1970s-inspired tops? 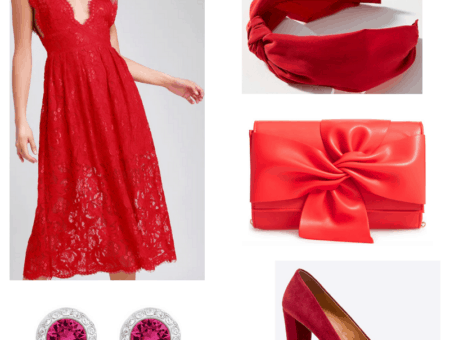 Do you like the outfit suggestions? What would you change? Tell me what you think in the comments!